Text by Laurie Stroupe. Photos by Rabbit Smarties and Laurie Stroupe. 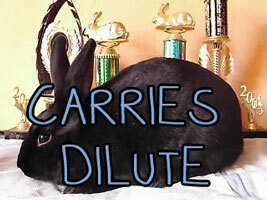 “Carries Dilute” is a notation you see on rabbits for sale. Why is that worth mentioning on a “for sale” rabbit? Well, if you are like me, dilute rabbits are among your favorite colors. So what are dilute rabbits? They are just like regular or “dense” rabbit colors except that there is less pigment in each hair. In the black color family, two dilute genes will turn the black to blue. 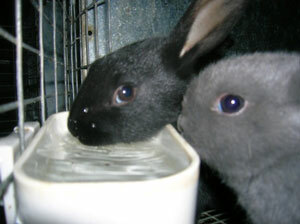 In the chocolate family of rabbits, two dilute genes will turn the chocolate to lilac. For every black color, there is a corresponding blue color. For every chocolate color there is a corresponding lilac color. Some black color family dense colors are black tortoiseshell, black, black sable, chinchilla and orange. Some chocolate color family dense colors are chocolate, chocolate tortoiseshell, cinnamon / chocolate agouti, and chocolate sable point. Some black color family dilutes are blue, blue tortoiseshell, squirrel, and smoke pearl. Some chocolate color family dilutes are lilac, lilac tortoiseshell, lynx and lilac ermine. A broken black tortoiseshell (dense) and a broken blue tortoiseshell (dilute) are shown here. The black baby on the left is "dense" and the blue baby on the right is "dilute"
The d-gene works just like the b-gene, since there are only two types of genes, one dominant and one recessive. If you understand how the b-gene works, you already understand the d-gene. We’ll start with the easy part first. If you breed two true-breeding dense color gene rabbits (“DD”) together, you get all “DD” offspring. Each parent has nothing but a “D” to pass on to the offspring. Likewise, if you breed two dilute color gene rabbits together (“dd”), you get all “dd” offspring. But what happens if you breed a true-breeding dense color rabbit (“DD”) with a dilute bunny (“dd”)? Then all of the offspring will be dense, but will carry dilute. Look at the chart below to see how this works. If you breed two dense color rabbits that carry dilute (“Dd”), then approximately 25% of the offspring will be true-breeding dense color rabbits, 50% will be dense color rabbits that carry dilute and the remaining 25% will be dilute rabbits. Theses are averages, you may get something a bit different with just a few bunnies. Comparing a black tortoiseshell with a blue tortoiseshell. Only genetic difference is that one is DD and one is dd. The combinations above address only the dense/dilute aspect of a rabbit’s color. The actual dense or dilute shade also depends also on the A/at/a, Bb, C/cchd/cchl/cch/c, and Es/E/ej/e genes. When you are trying to breed for a particular shade, it may be helpful to understand which colors only vary by the d-gene. For example, black rabbits have the genotype aa B- C- D- E- while blue rabbits have the genotype aa B- C- dd E- (the dashes represent unknowns that could be equally dominant or recessive, but have no effect on the phenotype [phenotype=the color you see]). Black and blue are just alike except for the difference in the d-gene. The chart below lists Holland Lops colors with the dense color in the left column and the corresponding dilute color in the right column. This is another dense/dilute comparison. The castor mini rex is the same color as the opal on the left, except that one is black based and one is blue based. The “Dd” gene is responsible for a lot or little color in the hair shaft. Dense colors are black and chocolate family colors. Dilute colors are blue and lilac family colors. Knowing the d-gene phenotype of a breeding pair of domestic rabbits can help you predict whether the offspring will be true-breeding dense, dense carrying dilute, or dilute. Perhaps you will get some of each. For every black or chocolate rabbit color, there is a corresponding blue or lilac color. You can use your knowledge of the d-gene and the color families to help you produce the colors you desire. Next Article: The E or Extension Series. Genetics for Steel, Tri, and more.